VietPress USA (Dec. 2nd, 2018): The World today can see a touching image of a loyal service dog named Sully of former President George H.W. Bush. 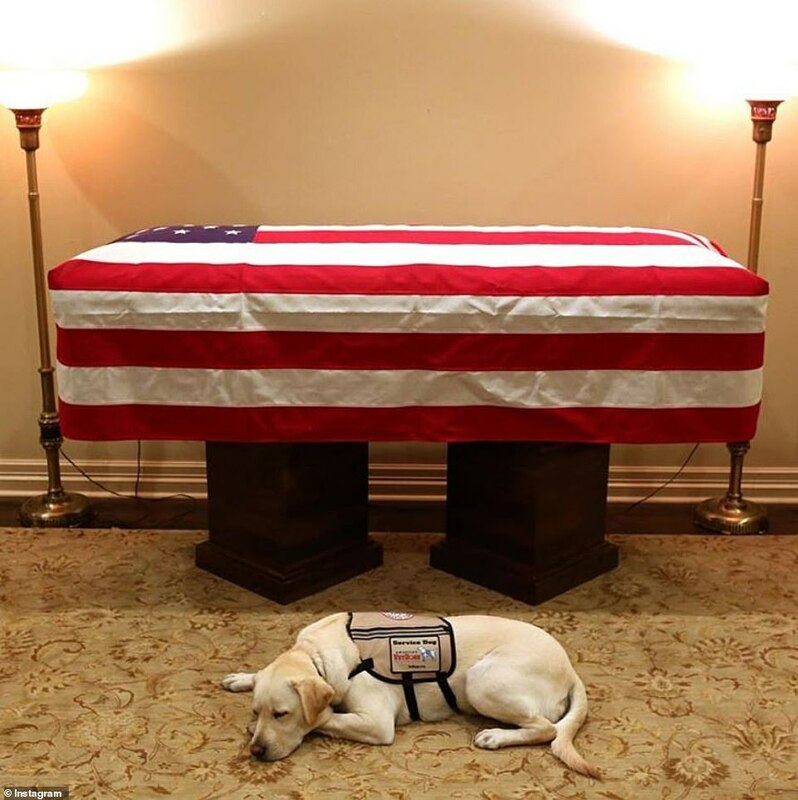 The image shows ‘Sully,’ a specially trained golden lab, mournfully lying down as Bush’s flag-draped coffin is seen a few feet from him. Sully was gifted to the elder Bush in June after the passing of former First Lady Barbara Bush. His mission isn't entirely complete, as it's been reported by CNN that the dog will accompany the casket to Washington, D.C. on Monday. 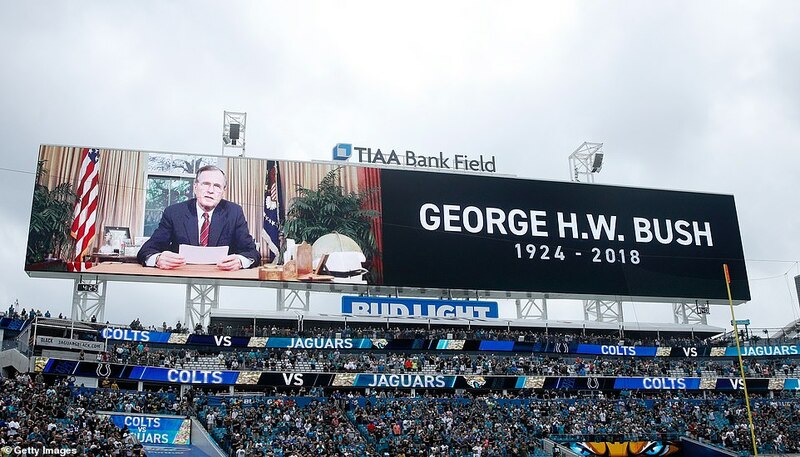 The image emerged just as Air Force One was landing in Houston to transport the coffin to Washington, D.C.
A heartbreaking image shows George H.W. 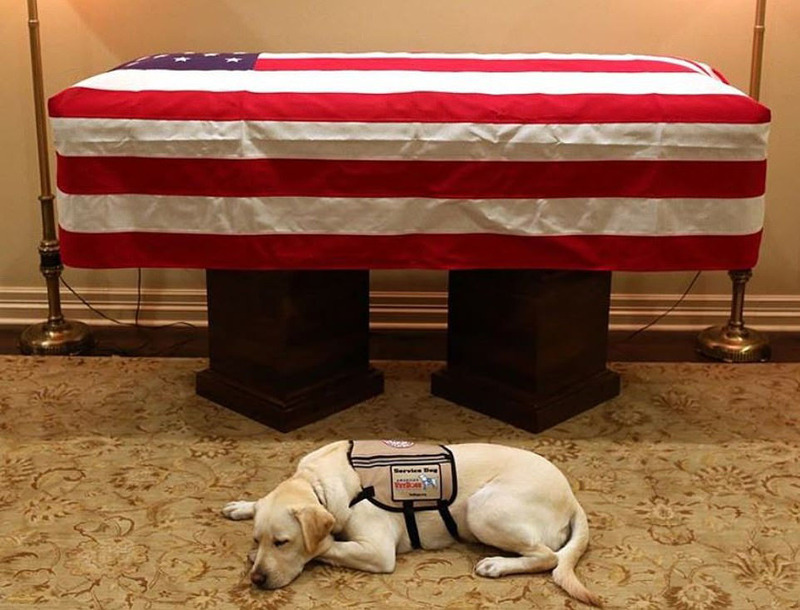 Bush’s service dog lying next to the 41st President’s coffin in Houston on Sunday. Bush’s official Twitter account posted an image of Sully and another former President, Bill Clinton, on June 25 after Sully’s arrival. The tweet read: ‘A great joy to welcome home the newest member of our family, "Sully," a beautiful - and beautifully trained - lab from America’s VetDogs. 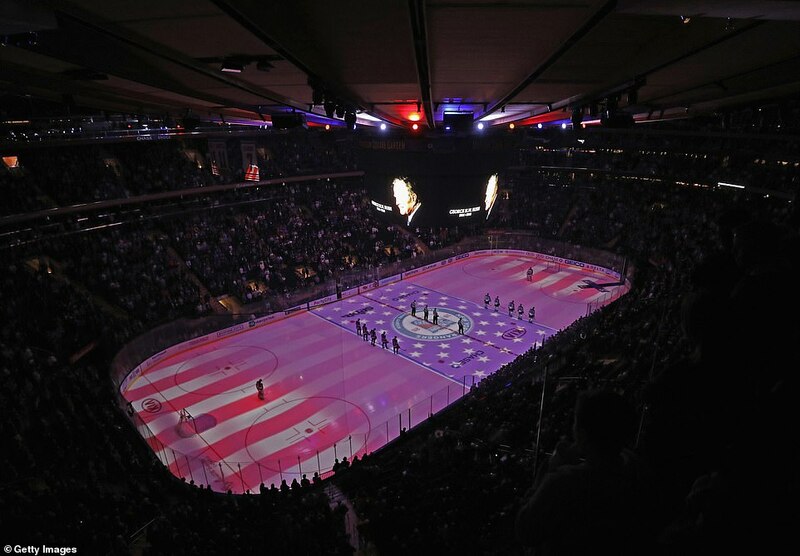 America’s VetDogs is a New York-based nonprofit group which provides service dogs to veterans in need. 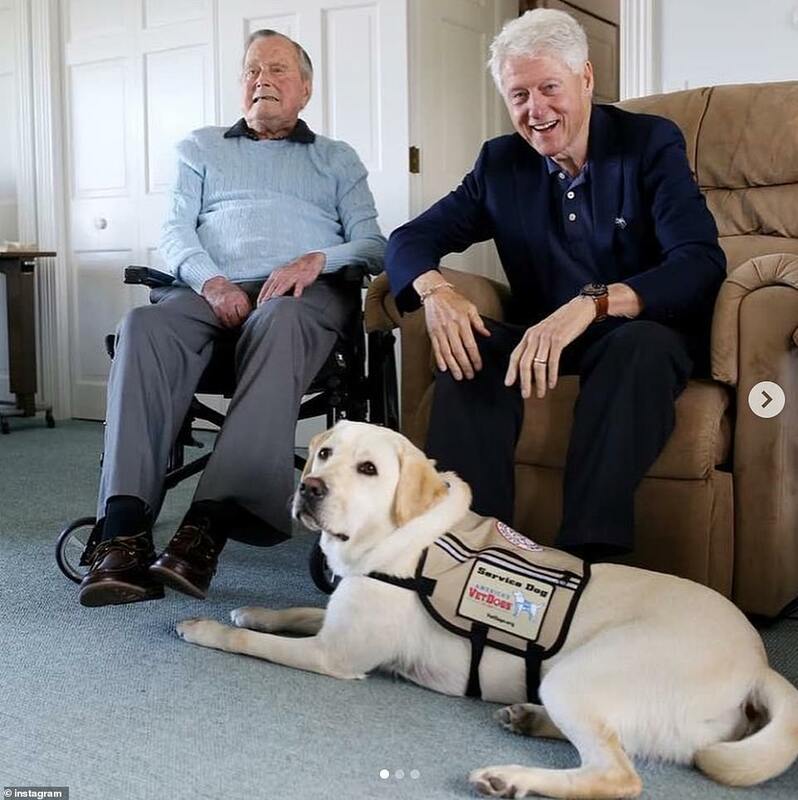 After news broke of Bush’s passing on Saturday, America’s VetDogs tweeted a statement, saying: ‘America’s VetDogs is deeply saddened by the loss of President George H.W. Bush. The tweet was attached to an image showing Bush being pushed in a wheelchair while holding a leash as Sully walks beside him. America’s VetDogs told KTRK-TV that Sully will return to its Smithtown, New York headquarters, where he will stay for the holiday season. He is then expected to be transferred to the Walter Reed National Military Medical Center’s Facility Dog Program in Bethesda, where canines help wounded veterans as they undergo physical and occupational therapy. ‘Our thoughts and prayers are with the entire Bush family during this difficult time,’ said John Miller, President and CEO of America's VetDogs. ‘It was truly an honor to have provided service dog Sully to be by the president's side for the past several months. ‘As a true patriot and a visionary, President Bush will forever be viewed by people with disabilities and their families as a hero through his efforts to enact the Americans with Disabilities Act. 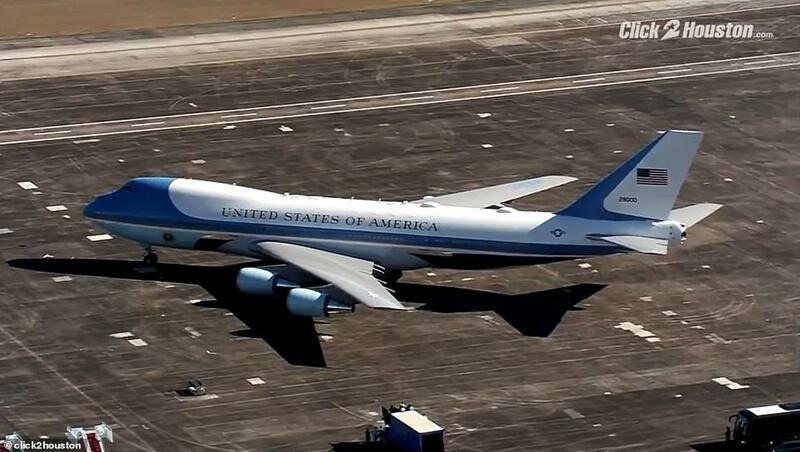 Meanwhile, Air Force One arrived in Texas on Sunday to transport Bush's body to Washington for a state funeral. Bush spokesman Jim McGrath tweeted a photo of the presidential plane on a tarmac Sunday afternoon. 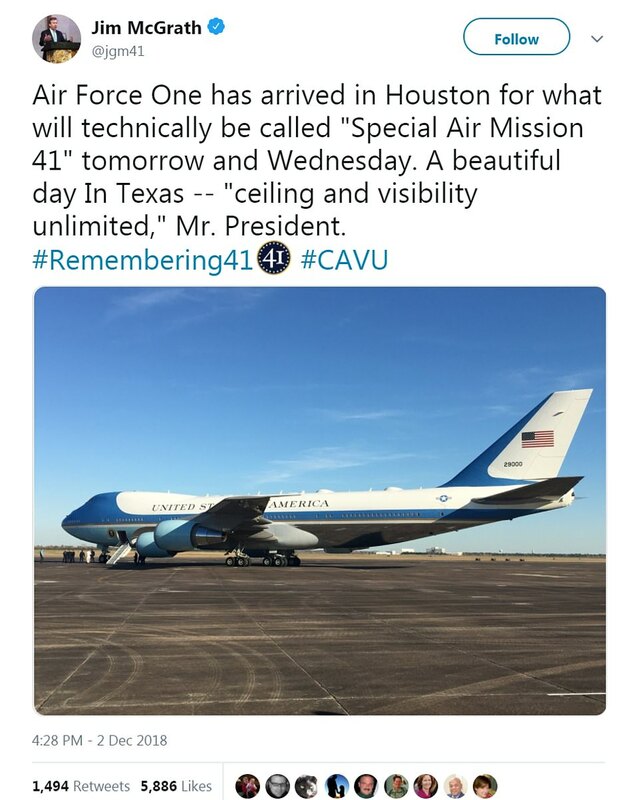 The aircraft will be temporarily renamed and redesignated as 'Special Air Mission 41' as it is only referred to as Air Force One whenever the sitting President is on board. The plane, known as Air Force 747, is only called Air Force One when the president is traveling in it. The 41st president died late Friday at his Houston home at age 94. 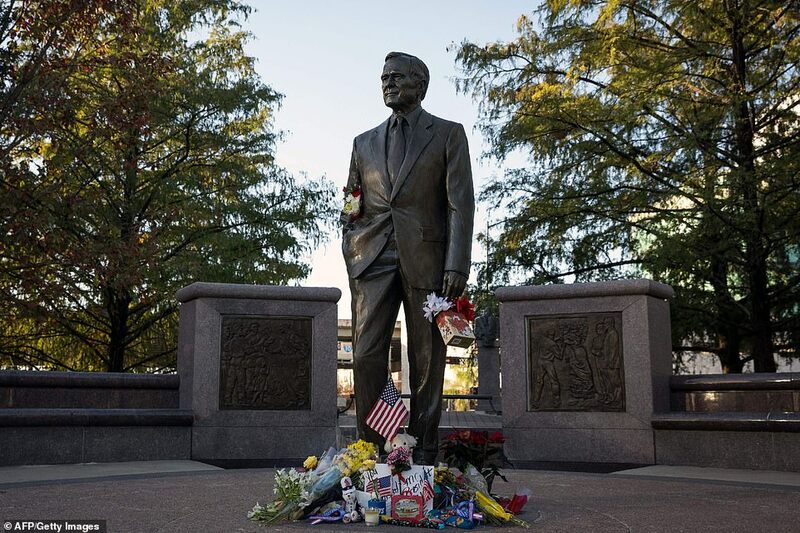 McGrath also tweeted a photo of flowers and a wreath which were left near a statue of Bush at the Houston airport which bears his name. 'Seen today at George Bush Intercontinental Airport in Houston,' McGrath tweeted. He will be honored during several private and public events in Houston and Washington before he is buried in Texas next to his wife, Barbara, and their young daughter Robin, who died in 1953. President Donald Trump dispatched Air Force One to Texas to transport Bush's body - a magnanimous gesture from a man who has historically been at odds with the Bush family. Trump tweeted on Saturday: 'President George H.W. Bush led a long, successful and beautiful life. 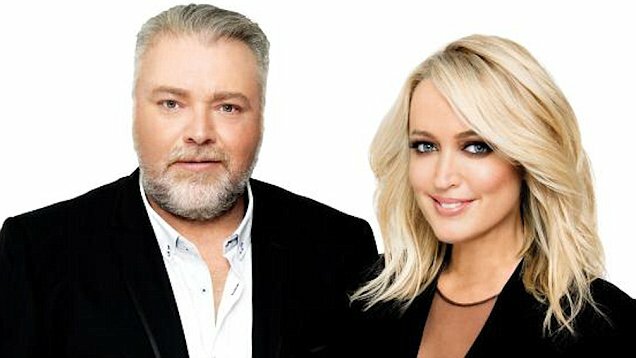 'Whenever I was with him I saw his absolute joy for life and true pride in his family. Americans will begin saying goodbye to Bush on Monday when his body arrives in Washington for public viewing in the Capitol Rotunda - a rare honor that will be bestowed on a man who earned the respect and admiration of many with his leadership, bravery and grace. The public viewing will kick off four days of events that will include a state funeral at Washington's National Cathedral on Wednesday and a private service at Bush's longtime church in Houston on Thursday. 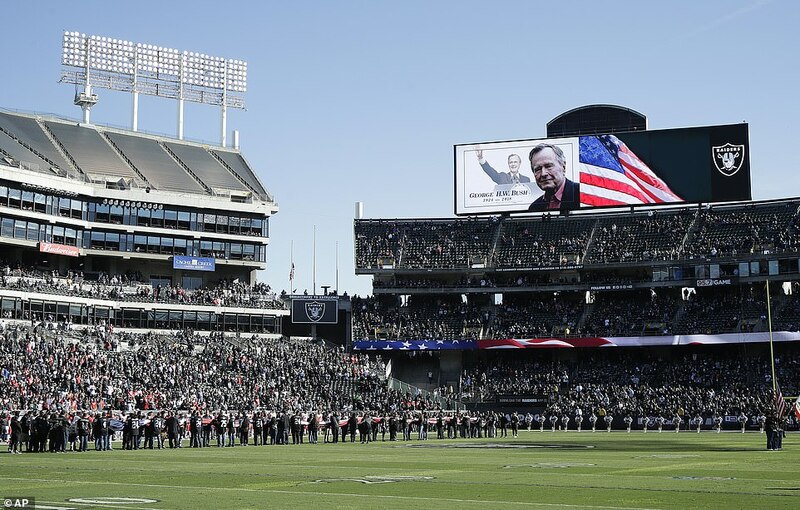 The sports world also paid tribute to the 41st President this weekend. 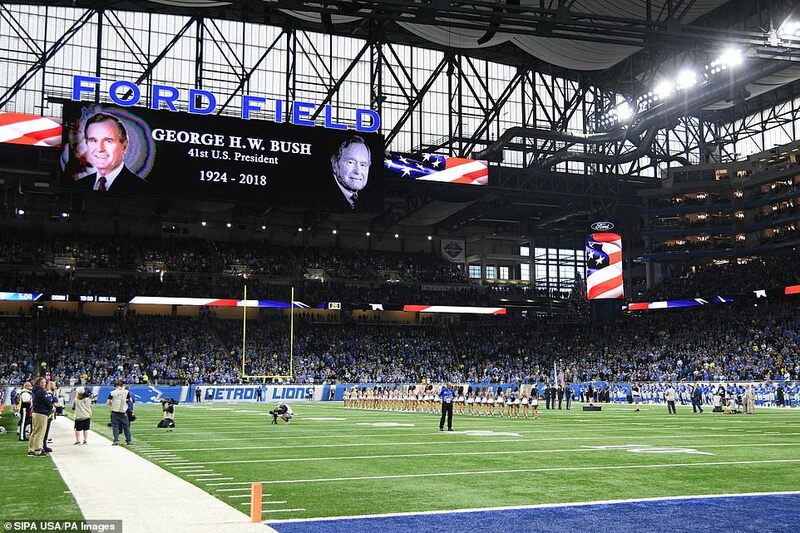 'Rest In Peace President Bush,' tweeted Houston Texans star defensive end J.J. Watt. The tweet included an undated photo of Watt visiting Bush. 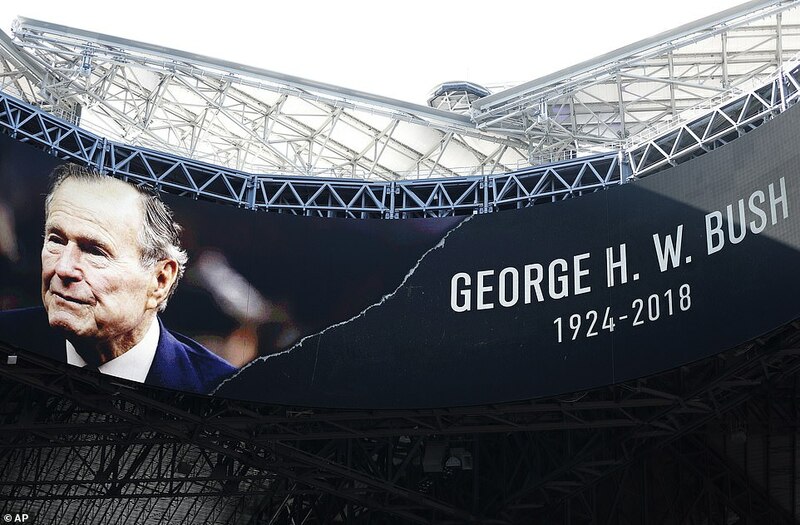 USA Water Polo, the sport's national governing body, tweeted: 'We are sorry to hear about the passing of President George H.W. Bush. The tweet includes two photos of Bush meeting the team at the 2008 Olympic Games in China. Major League Baseball's television network aired a retrospective about Bush's relationship with the National Pastime. 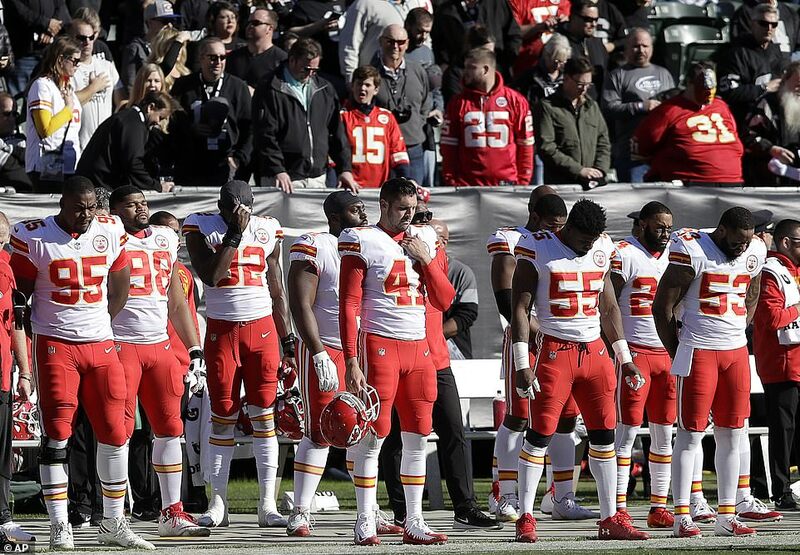 Case Keenum, the former quarterback for the Houston Texans, tweeted: 'Two great men who aren’t with us anymore. 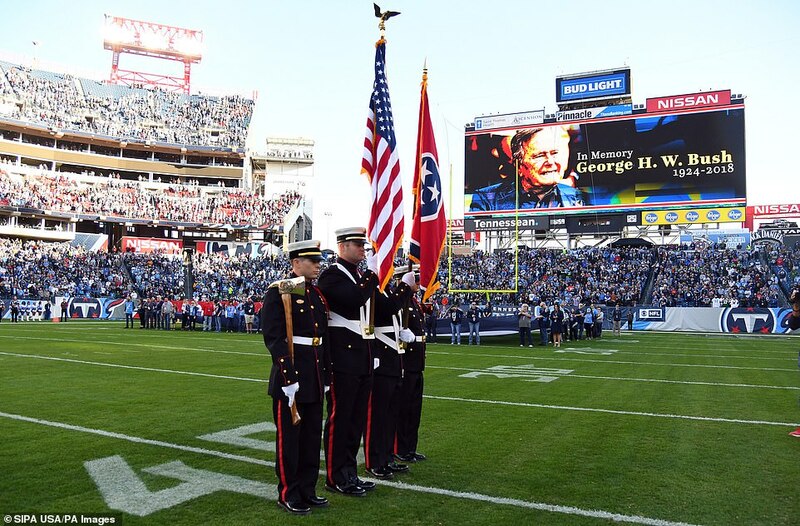 'Thank you George H.W. Bush and Bob McNair for leaving a legacy that changed this country and me forever. McNair, the late owner of the Texans, died November 23 at the age of 81. Another Houston sports star, Justin Verlander, paid tribute to Bush, tweeting a photo of the former President when he stood alongside the pitcher before a World Series game last year. 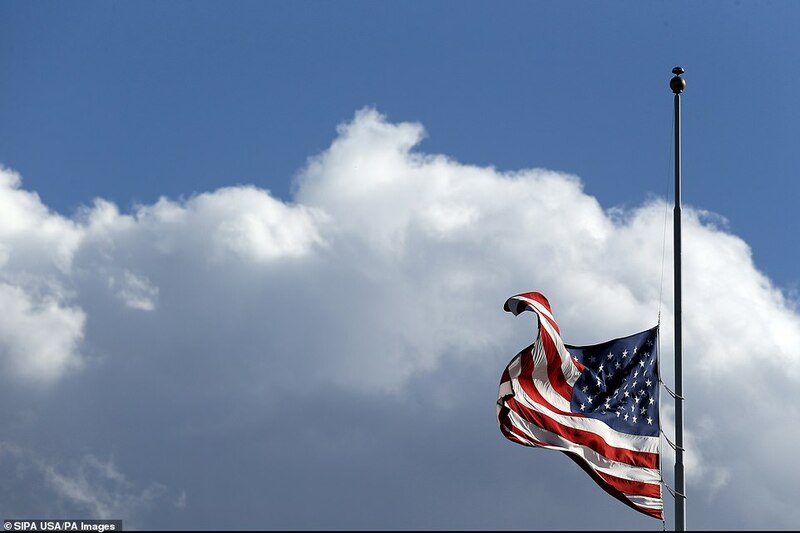 Americans will pay homage to their 41st President over the course of the next four days. On Monday, a departure ceremony will be held at Ellington Field Joint Reserve Base in Houston at 10:30am Central time. Bush's casket will be flown from Houston to Joint Base Andrews in Maryland. The plane carrying Bush's coffin is scheduled to arrive at 3:30pm Eastern time, when a ceremony will be held at Andrews. From there, the coffin will be taken to the U.S. Capitol. The casket will lie in state at the Capitol Rotunda beginning Monday at 5pm local time until 10am on Wednesday. A guard of honor will be in attendance, and the public will be allowed into the Capitol from 7:30pm Monday until 8:45am Wednesday. At 10:00am on Wednesday, Bush's coffin will depart the U.S. Capitol, which will see him off with a ceremony. The casket will be driven to Washington National Cathedral, where a memorial service is scheduled to begin at 11:00am. Brian Mulroney, the former Prime Minister of Canada, is one of three people who have been chosen to deliver a eulogy, according to Global News. After the 90-minute service, Bush's casket will be taken to Joint Base Andrews. It is scheduled to depart at 1:15pm. Bush is expected to arrive back at Ellington Field in Houston at 4:30pm Central time. The former President will lie in repose at St. Martin's Episcopal Church in Houston, the site of Barbara Bush's funeral in April. 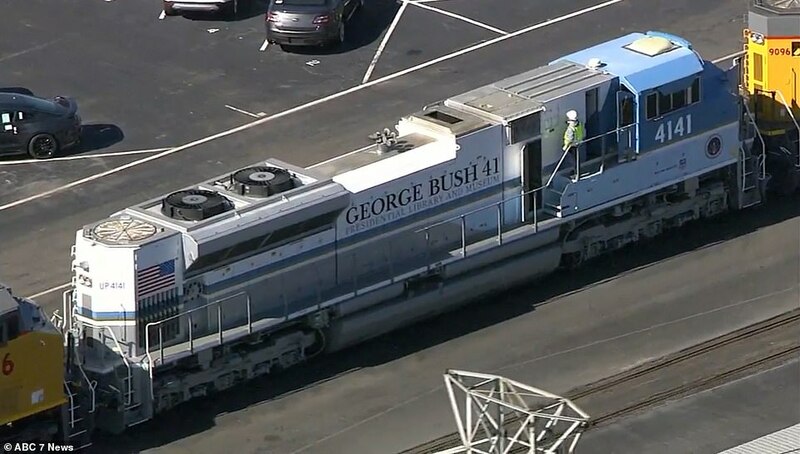 On Thursday at 12:30pm Central time, Bush will be taken by locomotive train to Texas A&M University in College Station, home to the George Bush Presidential Library and Museum. 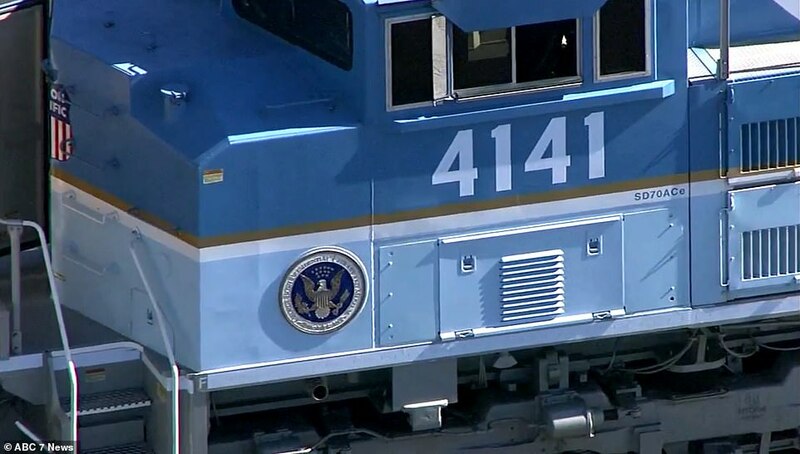 Bush, a lover of trains, will take his final ride in one that it fitted with a glass viewing car. He will be buried next to his wife and daughter, Robin, at 4:15pm Central time in College Station. Tilman Fertitta, the owner of the NBA’s Houston Rockets, tweeted: ‘The Bush family is the most prominent & extraordinary political family in the history of our country. ‘I enjoyed his friendship and admired him as a great leader who truly loved this country. 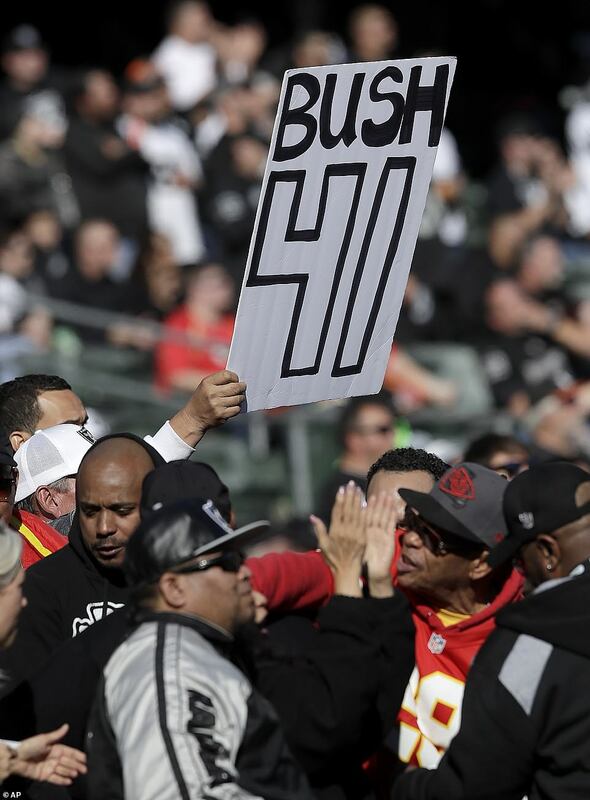 ‘An avid sports fan, Bush was a fixture at all Houston’s sport venues. 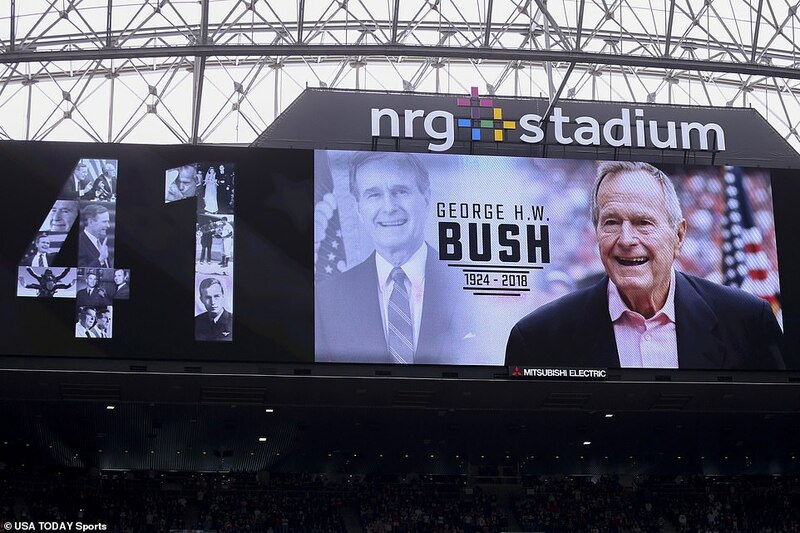 The Houston Astros baseball team’s owner, Jim Crane, released a statement which read: ‘President Bush was a great American who devoted his life to serving his country. ‘He epitomized class and dignity and was a true patriot. ‘The Houston Astros had the great privilege of hosting President Bush and his wife Barbara at Astros games for many years. ‘As loyal fans, they stuck with us through the challenging years and were there to celebrate Houston’s first World Series championship in 2017. ‘Game 5 of last year’s World Series is considered the most memorable and dramatic game in Astros history. ‘What made it even more special was that President George H.W. Bush and his son, President George W. Bush, were on the field that night taking part in the first pitch ceremony. 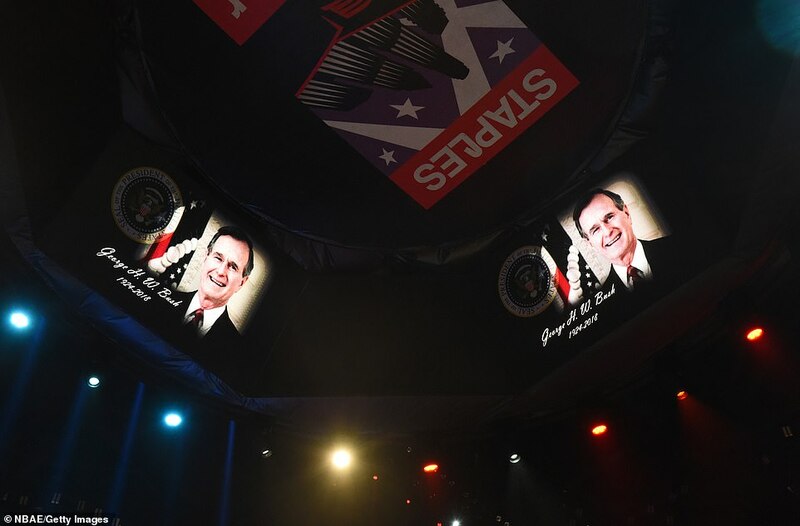 The National Collegiate Athletic Association, the governing body of college sports, paid tribute to Bush on its Twitter page. The NCAA posted a photo of Bush in his Yale University baseball uniform. During his college days, Bush was captain of the baseball team. ‘We mourn the loss of former President and Yale baseball captain George H.W. Bush. 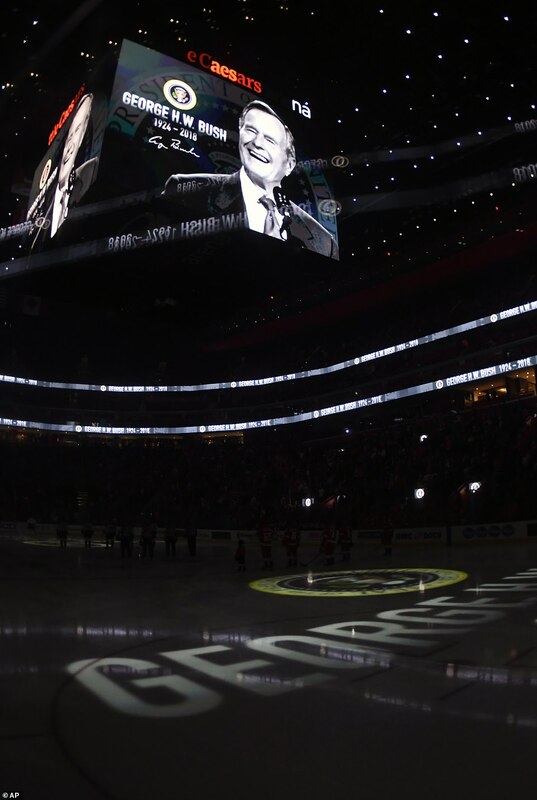 The National Hockey League also paid tribute to Bush. 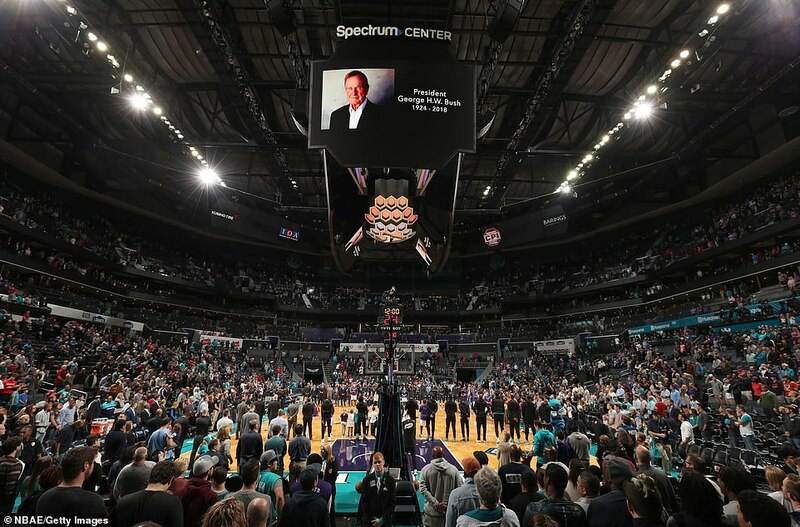 Moments of silence were held at arenas, including Detroit's Little Caesars Arena and New York's Madison Square Garden, on Sunday. 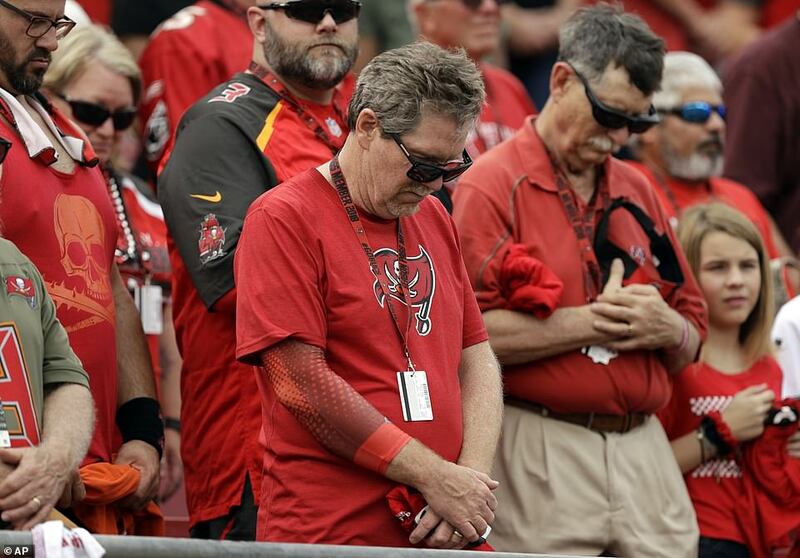 A moment of silence was held at NFL stadiums as well before games on Sunday. Tributes from leaders around the world have been pouring in since his death Friday night. 'He never forgot who he was,' Powell, chairman of the Joint Chiefs of Staff during Bush's presidency, told ABC's This Week on Sunday. Bush will be buried Thursday on the grounds of his presidential library at Texas A&M University. In Washington, D.C., he will lie in state in the Capitol Rotunda from 7:30pm Monday to 8:45am Wednesday. Trump, who ordered federal offices closed for a national day of mourning on Wednesday, is to attend with First Lady Melania Trump and other high-ranking officials. James Baker, Bush's former chief of staff and secretary of state, called his boss's tenure in office 'a consequential presidency' because of his foreign policy achievements.